Londoners, Have You Ever Noticed this Clock? I have walked past the Won Kei restaurant in Chinatown’s Wardour Street more times than I can remember, and I’ve actually eaten in there on multiple occasions. It’s a huge restaurant, known for its massive capacity and the rudeness of its staff (although I'm pretty sure this is now just an urban legend). It wasn't until recently though that I noticed the clock that sticks out above the entrance on either the second or third level of the building, but once you notice it, its pretty hard to miss. 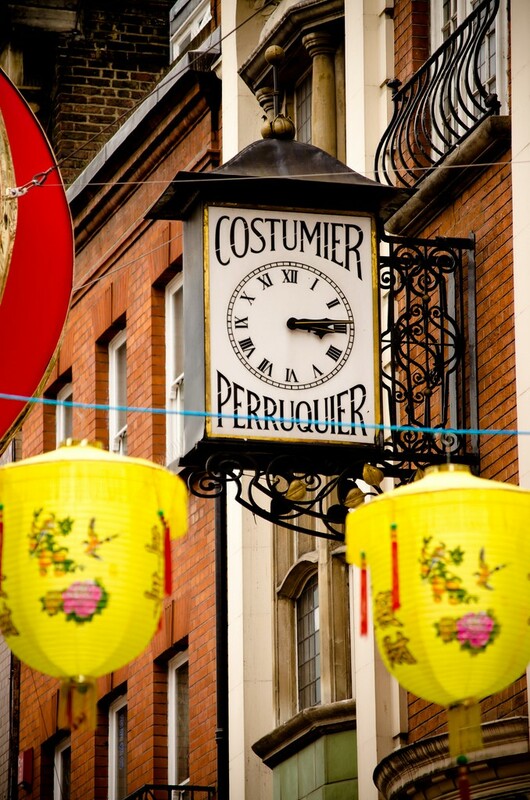 Between the neon restaurant signs and colourful supermarket shop fronts that grace Chinatown, the ‘Costumier Perruquier’ clock sticks out like a sore thumb. After a few glances at the words inscribed on the clock, I decided to do some digging and find out some information on the former tenants of the building. I presumed that the sign was left behind by an old costume house, and began to imagine something like a smaller Charles Worth, stocking the trousseaus of aristocratic daughters and the wardrobes of London’s elite. 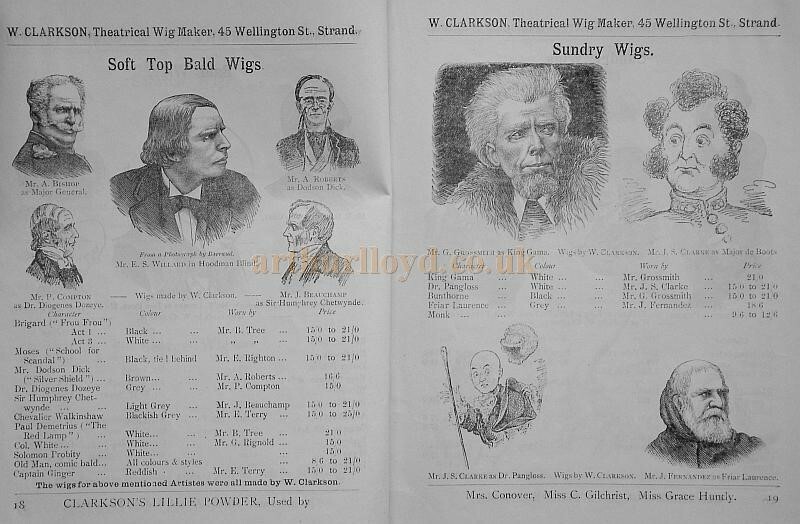 Willy Clarkson, as it turns out, was a well-respected and well-known wig and costume maker for the theatre, living and working at 41-43 Wardour Street between 1904 and 1934. Having begun as an apprentice in his father’s wig making business, he took over the family profession after his father died in 1878. 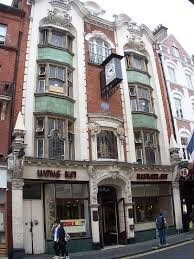 Originally his wigs were made at a different premise (45 Wellington Street), but he had managed to build such a lucrative company by 1904 that he was able to have new premises constructed in Wardour Street. The foundation stone for the new property was laid by Sarah Bernhardt, a famous French stage and early film actress of the era, and the coping stone was supposedly laid by Henry Irving, another famous Victorian actor - both examples pointing to how successful and well-known Willy was in the industry. ‘Let us for a brief space get to the "wiggeries." Not to know Willy Clarkson and his doings is to be out of the theatrical world, for Willy Clarkson, with the bright and easy (though sometimes anxious) manner is ever hovering "before and behind." Scarcely any big production in London to undertaken without the aid of the owner of the Wellington-street wiggeries’. The article goes on to talk about the way in which Willy’s company worked, and some of the products he made for clients - including an entire Guy Fawkes costume! More reading of this company and Willy himself unearths more interesting information, including criminal activity, fines, and shady characters. Apparently Willy also ran a small side business in disguise design, and was responsible for designing many disguises for Scotland Yard detectives. These men were ‘made up so marvellously that it [was] impossible to detect the paint, though you may be in a man's company for an hour’. His disguises apparently became some infamous that at one point he was even accused of designing a disguise for Jack the Ripper, as well as the police agents assigned to his case! Whether this affected Willy’s business in any way, I cannot tell, but it certainly must have made his name and company very public! In 1898 the same magazine that published the article above published a new headline for Willy Clarkson, which read: ‘Willy Clarkson goes to court over Sunday Working for Women’. Apparently, a factory inspector had called one Sunday on another of Willy’s premises to discover 15 women engaged in the production of pantomime costumes. In the late Victorian period, employment of women on a Sunday was illegal ‘under the Factory and Workshops Act, 1878, section 21, chap. 16’, and Willy was required to pay a fine of one shilling and the prosecution costs of £3 9s, 6d. I came across a few stories like this, which point to Willy being an exceptionally successful, but possibly shady, businessman. Willy Clarkson was a well-respected and interesting character of the costume history world who has fallen into obscurity. I wonder how many other hidden treasures of information there are similar to this throughout London, which can be discovered simply by glancing upwards? Ruby Valentine, Costume Society Ambassador, 2016.